Mario Kart is something that will never die and can never be looked at in a negative light. Even if Nintendo as a whole were to disappear off the face of the planet, people would remember this iconic game series for years & decades to come. It's just so fun, so innocent, so pure. Thankfully companies have been offering RC manifestations of Mario Kart fever for many years, with the earliest ultra-micro versions appearing on the market in Japan in 2003. It's now 2011, and thanks to Air Hogs, folks in North America can again race Mario & Yoshi around our computer desks & kitchen tables. 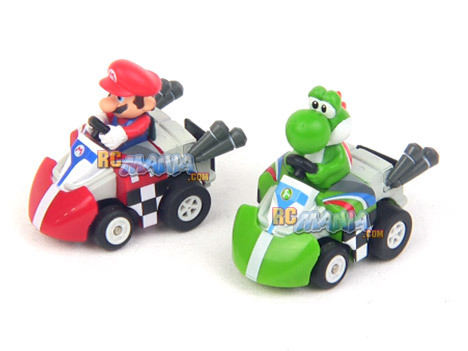 Each car is about 2 inches long and captures the highly cartoonish look of the respective character from the game, even if the proportions of the kart itself are a little off. The controllers are pretty tiny as well, though a good deal larger than those that came with the earlier Micro Terrain Titans minis. Each controller does still double as a charger for the cars, a feature that's very familiar to most Air Hogs product owners. Also included in the package is a die-cut cardboard set of track barrier pieces and a start/finish gate that you fold up & tape together to help accessorize & beautify your own little race course. Turning on one of the Air Hogs Mario Kart Battle Set cars gives you no feedback at all. No surprise. Turning on a controller, on the other hand, greets you with a little start-up music and an audible racing count-down that immediately snaps you into "Ooh, I better get ready!" mode. The Battle Set cars, unlike the cars in the series that are sold individually, feature advanced controllers that give you not only sounds, but power-ups as well. You'll see how it works in the video, but in essence you get realistic Mario Kart game-style power-ups assigned to you as you drive along, and you can use them to either give you a boost or give your opponent an unexpected spill. As RC cars, these little karts are incredibly... slow. Except when you get lucky enough to score a quick speed boost power-up, the cars move at what can only be described as a lazy crawl. Surprisingly, this isn't such a bad thing. I owned the 2003 Mario Kart cars of this size back in the day (part of the Bit Char-G series by Tomy), and at that time I was into fixing them up with better tires & faster motors and other performance parts. When you make cars this small move fast, they become incredibly difficult to control in a small space. You literally quickly end up needing an area about 6 feet square with lanes that are a foot wide just to have a basic track that the average RC'er can get around without constantly crashing. This is a case where being slow is a good thing. You can set up an impromptu track literally on a desk or table, using things like pencil holders, pens, and piles of paper clips as lane markers and barriers. Racing with Yoshi against a friend driving Mario, though, it quickly became frustrating as we dealt with a very unexpected problem. Mario was just a little faster than Yoshi. Especially when you're already going this slow, a tiny difference in speed can consistently make the difference between a close race and a one-sided run-away. It quickly saps all of the fun out of it if you're stuck driving the slower car. We got actually got a second set to test, and in that one, Yoshi had the slight advantage in speed. Interestingly, even the slower Mario from the second set was quite a bit faster than the faster, but now well-used Mario from the first set. It seems the cars lose a little speed over time as you use them more & more. Another thing about the racing action is that as soon as the power-ups become available, unless you're playing with "no power-ups" rules or "speed boost only" rules, any chance of actually racing tends to go down the tubes. Getting hit by an opponent's attack can set you back almost hopelessly, until you have a chance to hit them with your own. It becomes more a game of chance than any skill, where whoever gets the longer-lasting power-ups is practically guaranteed to win, even if the other person is a significantly better driver. It can still be fun for a while, at least until one driver has a demoralizing string of bad luck with the randomization, or misses with their own attack. The Mario Kart RCs are always fun to watch and play with, and the Air Hogs Battle Set versions pump up the action and excitement with sounds and the great power-up feature. However, having a pair of toys that are supposed to be equal, but are not, is a recipe for certain play-time disaster consisting of fights for "the better one" and/or "I don't wanna play anymore" fits by whoever gets stuck with the worse one. The cars are still really cool, and mature owners can compensate by assigning the faster car to the less skilled driver, but quality control and performance really needs to be more consistent to make this a successful play set.